Oregon, which hosts Cal Wednesday night, was a runaway preseason choice to win the Pac-12 title, but finds itself with fading NCAA Tournament hopes. A season-ending injury to freshman center Bol Bol, the showpiece of what was regarded as a top-five recruiting class, is a major reason that Oregon, (14-8, 4-5) faces an uphill climb to make the Tournament. Bol was averaging 21.6 points, 9.6 rebounds and 2.7 blocks per game when he sustained a serious foot injury against San Diego State, Shortly after he was declared out for the year, he announced he was going to stick with his original plan and declare for the NBA draft. Senior guard Paul White, who has been the Ducks’ most consistent performer, has a bum ankle which has slowly worsened since he first hurt it against Arizona State Jan. 19. He has been held out of practice this week and how healthy he will be Wednesday is unclear. White has been playing the best basketball of his college career as of late and is averaging 13.1 points and 3.9 rebounds in Pac-12 play. In eight of his last ten games, White has scored 10 or more points. 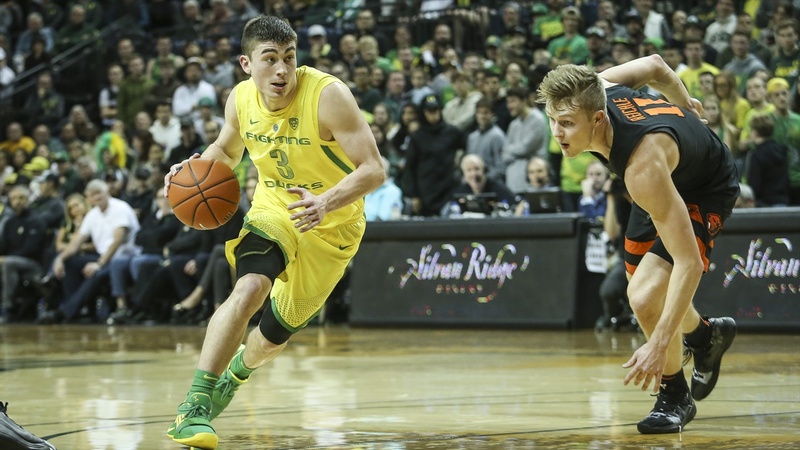 "When Paul White is off the floor, we have a hard time running anything," said Altman. "He's a big part of our offense. We run a lot of things through him. Our shots when he's in the game are much better, now we've missed a lot of them, but our shot selection and our shots we get when he's in the game are much better." The Ducks still have plenty of young talent, just not anyone in Bol’s class. And consistency was an issue, even before Bol’s injury. “I like our freshman class, a great deal,” head coach Dana Altman said in the coaches’ conference call Tuesday. “ Bol got off to a great start. Our other four have all made progress. Francis Okoro (6-9) has played well at times. He needs to relax a little bit. Miles Norris (6-10) has played tough for us here of late after Bol went down. In truth Altman did not miss any shots in that game, but had he been in uniform he probably would have. Following their spirited victory in Utah on Thursday the Ducks were 18-for-58 in Boulder, including 4-for-25 from three-point range in a 73-51 loss. The fact White was limited to 14 minutes had something to do with that. Colorado coach Tad Boyle gave the Ducks the benefit of the doubt, saying that they might have been gassed after a tough game in Utah. Cal (5-16. 0-9) can count on Oregon being well-rested and comfortable in Matthew Knight Arena Wednesday night. Richardson was the eighth different Duck to lead his team in scoring this season. Junior point guard Payton Pritchard (3, above) is the team leader, and is especially important if White is out He is second on the team (not counting Bol) in scoring at 11.4 points per game to go with 99 assists. “Obviously Payton Pritchard is the guy that kind of makes them go,” Jones said. Since he and Richardson have become the regular backcourt they have combined for 58 assists and 23 turnovers, for an assist-to-turnover ratio of 2.5-to-1, an average that would be tied for first in the Pac-12. Jones also mentioned that 6-9 sophomore Kenny Wooten “does a great job protecting the paint.” He has 31 blocks this year and 122 for his career. Counting his time at Creighton Altman has coached 21 consecutive winning seasons, a total exceeded by only five other active coaches, Jim Boeheim, Mike Krzyzewski, Roy Williams, Bill Self and Tom Izzo. You can find all those guys in the Hall of Fame. Following the Wednesday night game, the Bears cross the state to Corvallis and take on Oregon State Saturday afternoon at 2:30. The Beavers (14-7, 6-3 going into Thursday’s game against Stanford) are in prime position to have their first conference winning season since the days of Gary Payton. They are coming off a sweep of the mountain road trip and will be heavily favored. Tres Tinkle, the 6-8 son of head coach Wayne Tinkle, is an odds-on favorite to be Pac-12 player of the year. He is second in the Pac-12 in scoring per game (20.8), fifth in rebounds per game (8.1), and eighth in assists per game (4.1). The downside is that he has been bothered by a sprained ankle. Wayne Tinkle said Tuesday that he was really bothered against Utah on Saturday. HIs status for Thursday was not clear on Tuesday afternoon. Transfer Kylor Kelley (7-0) has been a revelation. He is second nationally in blocked shots per game (3.68) and is third in the Pac-12 in field-goal percentage, shooting 64 percent from the field. “If you look back maybe two weeks ago, our defense of two-point field goal percentage was really really good. And then he just was in a little bit of a funk there for three or four games,” Wayne Tinkle said Tuesday. “We gave up a much higher percentage because he wasn’t in there. He’s such a rim protector and enables us to put a little bit more pressure on the ball on the perimeter because of his ability to protect the rim. We missed it for a few games. He had a great second half against Utah and we’ve got him back to where he was early in the conference where he’s confident in what he’s supposed to do for us defensively. The Bears Tourney hopes are fading? Couldn't you have at least advised the season ticket holders of that state of affairs in a private email rather than letting us see it in an insensitive headline?